Our cavity injector is for use in conjunction with the standard flat bottles. Thumb should be placed over air vent before raising the bottle to desired height. Injection is controlled by releasing the thumb. 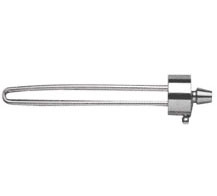 The “U” shaped air tube prevents usual breakage at this point. Our new type will not leak fluid. Full machined body and chrome plated. Cavity injectors come in 3”, 5” and 7” lengths.